“JIGYASA” is one of the major initiative taken up by CSIR at national level, during its Platinum Jubilee Celebration Year. CSIR is widening and deepening its Scientific Social Responsibility further with the programme. 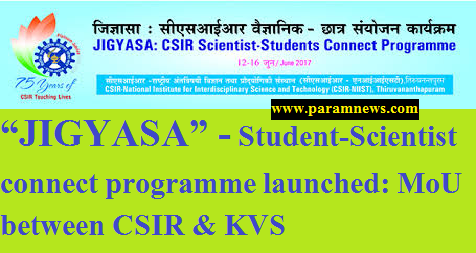 “JIGYASA” - Student-Scientist connect programme launched Signing of MoU between CSIR & KVS Student-Scientist connect programme “JIGYASA”. 1151 Kendriya Vidyalayas connect with 38 CSIR Laboratories targeting one lakh students and nearly 1000 teachers annually.